I like socks. This must be stated, in case there was any doubt. The wilder the pattern; color, image, stripes, you name it; the more I like them. Having a lot of socks means I don't wear them out as quickly. It's interesting, however to see which socks need fixing sooner than others purchased as the same time. Having a lot of socks means some don't get worn very often. 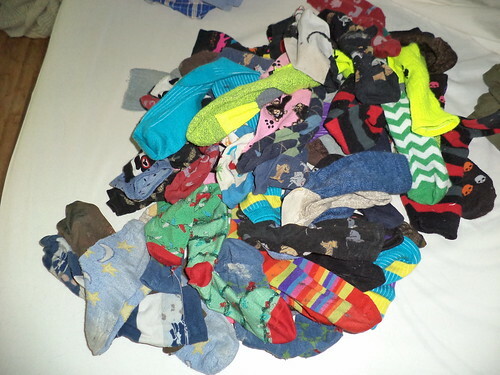 I thought it would be interesting to just accumulate the socks in a pile as I washed them. Finally, the pile tipped over and part spilled onto the floor. That was my cue to ball them up and put them in the drawer. Yes, that is a lot of socks. My favorite pair; the black, gray and red striped one; is in the pile. I also really like the Under Armor chartreuse pair. There are cat socks, holiday socks, socks from different cities, stripes and spots. The blue and white sock at the bottom of the screen is from a pair I have had for at least 15 years. I've never needed to fix them, either. They have worn like cast iron. Yet, if asked what I'd like for Christmas or birthday, socks are on the list. You can always find something wild and wacky that I'll love. Good think you don't have a dog. I read of a dog in Oregon that ate 43 socks!